Five final-year masters of engineering students have beaten 13 other university teams to be crowned overall winners of the Institution of Mechanical Engineers’ Unmanned Aircraft Systems (UAS) Challenge. 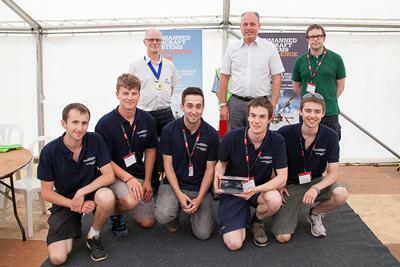 The annual event encouraged teams of undergraduates to design and build a UAS with specific mission objectives from September 2014 – before competing in a final ‘fly-off’ and judging that took place on 1 and 2 July at Bruntingthorpe Airfield in Leicestershire. 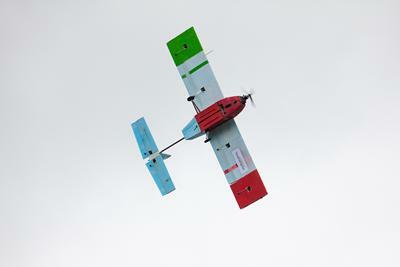 Victory for the Southampton team was, however, in doubt after their fixed wing aircraft crashed on a test flight just days before the final set of judging. “Before the crash we were confident of our chances. We had prepared well and our aircraft was performing extremely well. The crash changed everything and we were very close to giving up but we were reluctant to abandon almost a year’s work and, with the help of University staff and some very late nights, we rebuilt the aircraft and managed to put together a reasonable airframe. The group had already won the University’s first annual Design Excellence Award for their Group Design Project involving the same fixed wing Unmanned Aerial Vehicle (UAV). Among their design innovations which impressed the judges, team members came up with a new suspension system using memory foam and used 3D printing to integrate all the essential avionics within the tail.